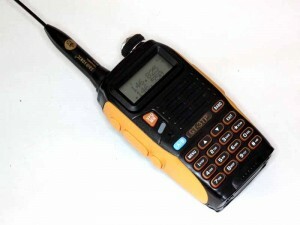 Above, the Baofeng GT-3TP purchased for about A$85 delivered overnight from Sydney. The supplied AC charger is an unapproved switch mode plug pack with a US two pin plug and supplied with an adapter. It is illegal to sell power supplies like these in Australia and it may be only a matter of time before someone complains to consumer affairs and the supply may be stopped. 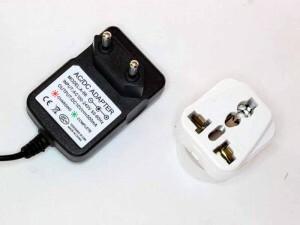 (I have purchased a 10V 1A power supply with AU pins to replace the supplied adapter.) The plug pack is rated at 10V output at 0.5A, which raises the question as to how to charge the radio from a car battery (at up to 14.5V). 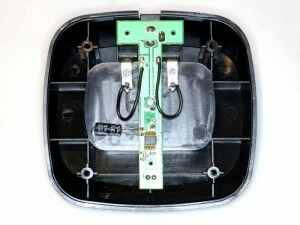 The charger base contains electronics, probably a small switch mode charge regulator. It starts conducting for input voltage above about 8.5V, and current stabilises by about 10V. The charger stops operating at input voltage above 15V. 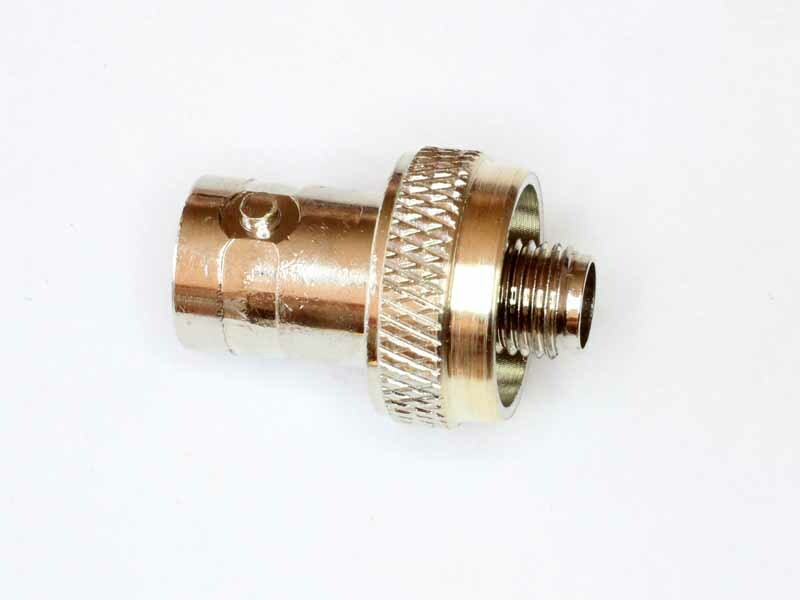 The Cigarette Lighter adapter appears to have no electronics in it, it contains a fuse and appears to have no other components, just connecting wire. Nothing in this thing limits the output voltage to 12V as implied by the rating plate. 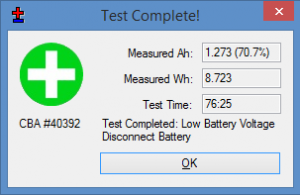 Tests reveal that the input voltage needs to be below 12.5V for the charger to work properly, and above 10V for full charge rate. Basically, the supplied car adapter is not suitable. The battery charging system is poor overall. 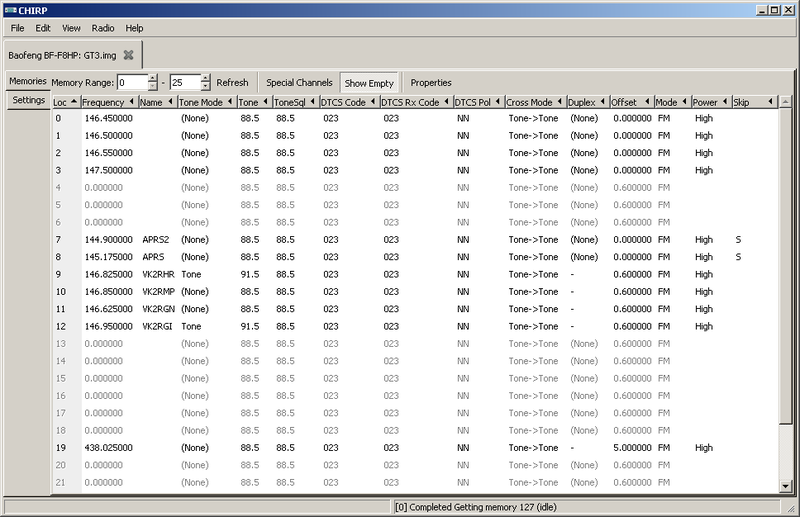 The supplied USB to radio programming adapter uses a Prolific USB/RS232 chipset and is a problem. I wasted a lot of time on it, and much has been written about Prolific. The package comes with lengthy instructions on how to get back level drivers from a third party site (dangerous) and to install them and disable ALL Windows driver updates to prevent automatic upgrades.. Fact is that if the adapter does not work with up to date drivers, by implication the adapter uses counterfeit chip or is obsolete… neither of which is satisfactory. I did have success with a generic FTDI adapter and a RS232-Kenwood programming cable which worked fine with Chirp and with the Baofeng software. The Baofeng software comes up in Chinese, and if you are patient, you will eventually find a menu item to change the language to English… which it forgets when you close it. You cannot cut and paste rows in the table. 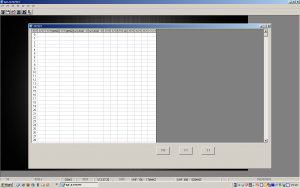 Forget the Baofeng software, a total waste of time. 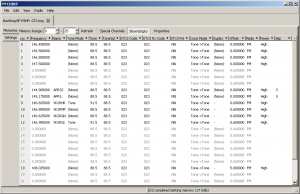 Chirp is a generic programming software that supports lots of radios, and more importantly, allows cut and paste between them. The developers complain about the lack of stability from Baofeng, and you will need to get the most current development update at this time, and select model BF-F8HP. Above, the Chirp screen copied from an IC208H over the Baofeng table. For all the warnings issued by the software, if you can get a suitable adapter to work with this software, it is worth doing. 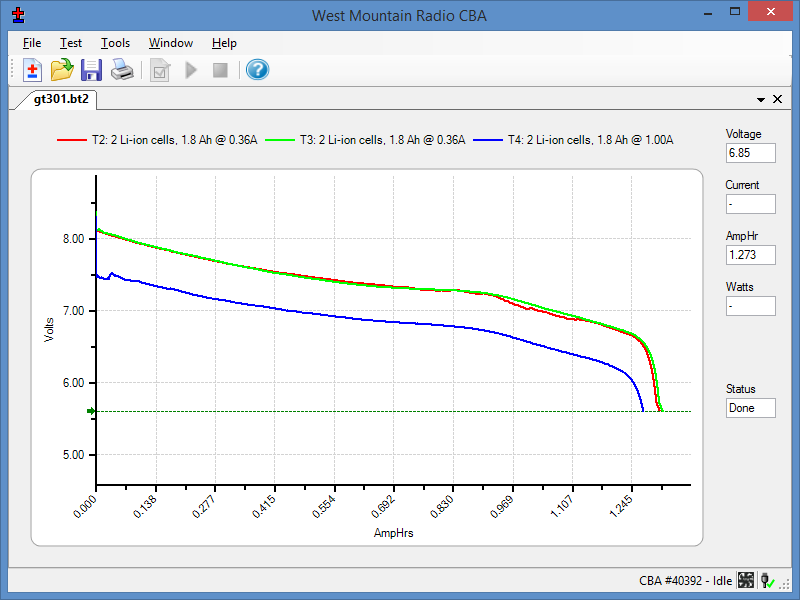 On a test at 146.500MHz, the transmitter was 150Hz low and delivered 6W on a partly discharged battery. Deviation was 3-4kHz on voice. On receive, mute opened on squelch=3 at 0.1µV and SINAD was 12dB. Subjective audio reports are good, the inbuilt speaker is good. The 1800mAh battery was fully charged and discharged three times. Above are the second and third (T2, T3) 0.2C discharge curves. There is essentially no increase in capacity with additional charge cycles, so it is safe to take the battery capacity to be 1300mAH (at 0.2C rate), just 73% of the rated capacity. 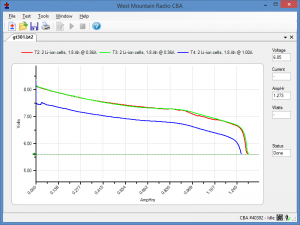 The T4 curve is a 1A (0.56C) discharge to simulate 50% tx duty cycle at full power (1.8A @ 7V), and capacity is just under 1300Ah, 71% of rated capacity. I usually throw batteries out when their capacity falls to 2/3 (67%) of their rated capacity, this new battery is almost at the service limit… speaks volumes for Chinese quality (an oxymoron you say). 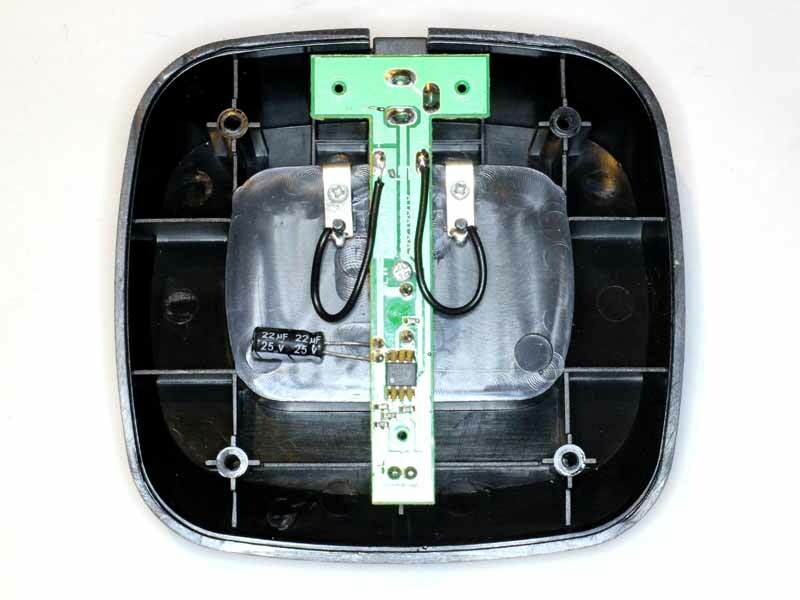 The battery is not very secure in the cradle, and if subject to vibration (eg used in a vehicle) the radio is inclined to fall out of the cradle. It is not very practical, and the worst charging system I have experienced. The high capacity battery does not seem to be readily available, though it appears possible to buy the radio with the high capacity battery. The battery supplied is poor. 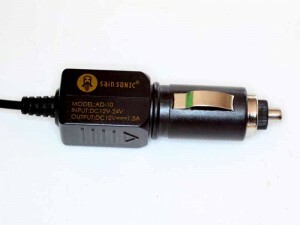 The radio uses a SMA male antenna connector. Whilst these are not uncommon, the Baofeng’s is recessed more than most and common after market antennas and adapters may not fit. Above is a BNC adapter that needed a rebate turned into it so that it would fully engage the Baofeng’s connector. Similar modification was needed on a Diamond RH771 antenna. The speaker-mic jack seems recessed a bit more than desirable as it prevents some third party programming adapters and speaker-mics plugging fully into the jacks. The On/off switch is on the volume pot, and the detent is very weak so it is easy to accidentally turn on, eg brushing against clothing if it is on a belt clip. The supplied antenna gets noticeably warm. 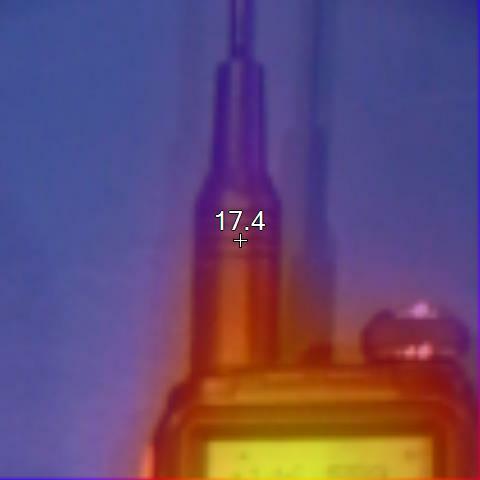 Above is a thermograph after 2min transmission at full power (~6W) on 2m, the antenna exterior has increased in temperature about 25°, internal rise will be higher. The transmitter and receiver work reasonably well. The battery charging system is unapproved, dangerous and inadequate. The supplied battery has significantly less than rated capacity. The antenna is grossly inefficient and suffers localised excessive heating with deforms the plastic. The supplied programming adapter uses a Prolific chip and has serious compatibility problems with Windows. A replacement adapter will be needed with the latest Windows. The supplied programming software is very poor, but Chirp is a good substitute.